As we were packing up camp, we noticed a bunch of people heading from north to south (the opposite way we were headed) with huge packs, most of them with ponchos that covered both the person and the pack. This made for a really interesting sight — these normally small people with massive appendages sprouting from their backs, all covered in bright orange, red, yellow, or some combination thereof. The coast line around Bonilla pt. is perhaps most recognizable by the interesting sea stacks that litter the coast line. 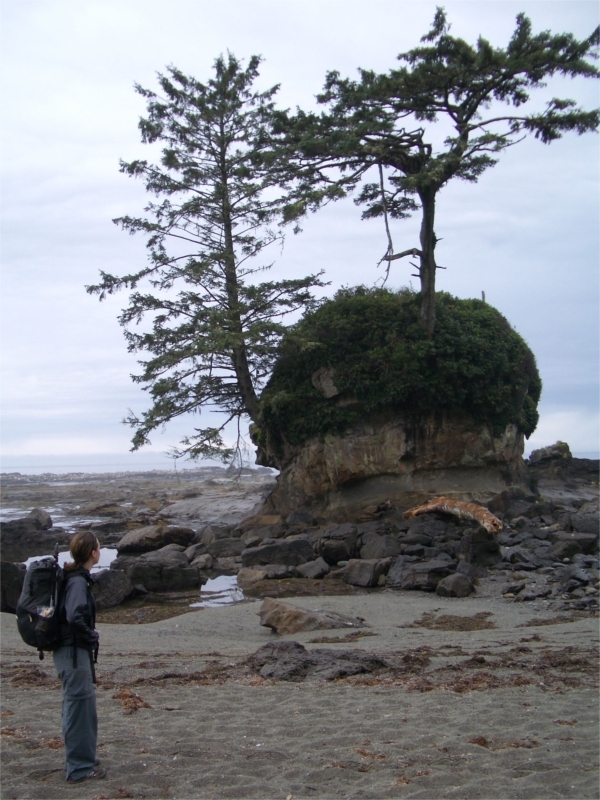 Many of them have some form of vegetation on top – either bushes or even large trees. After about ten minutes or so of walking along the beach, the drizzle stopped and things started to dry up. Rounding the corner of Bonilla Pt, we were treated to peek-a-boo views of Carmanah Lighthouse. As we approached the cable car at Carmanah Creek, we spotted the first gigantic flock of seagulls (“and I ran, I ran so far away…”). Some hikers we passed going the other direction the day before had warned us about them, but it was still hard to fathom how many of them based on their description. Tim & Bill kicked it into top-gear and took a hard detour up the beach to avoid them. Theresa and I had a very different experience with them. It was quite inspiriting walking among them, and we took our time. They were everywhere – no sooner would you get within ten feet of them and they would fly up in the air, over you and land behind you. Theresa’s dad died several years ago and he always said that he wanted to be reincarnated as a seagull. He loved the ocean and the outdoors and probably would have relished a hike like this. 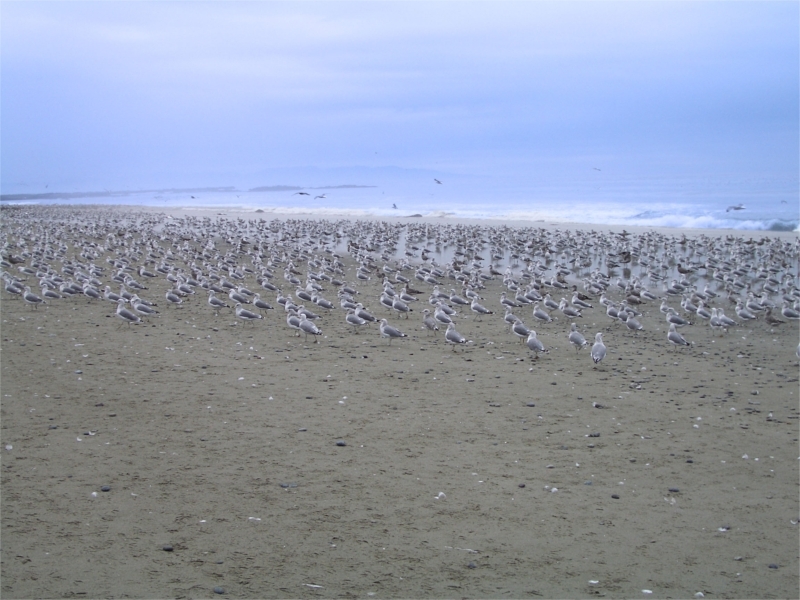 We walked amongst the thousands of birds and wondered if he was here in the crowd somewhere. arms wide. 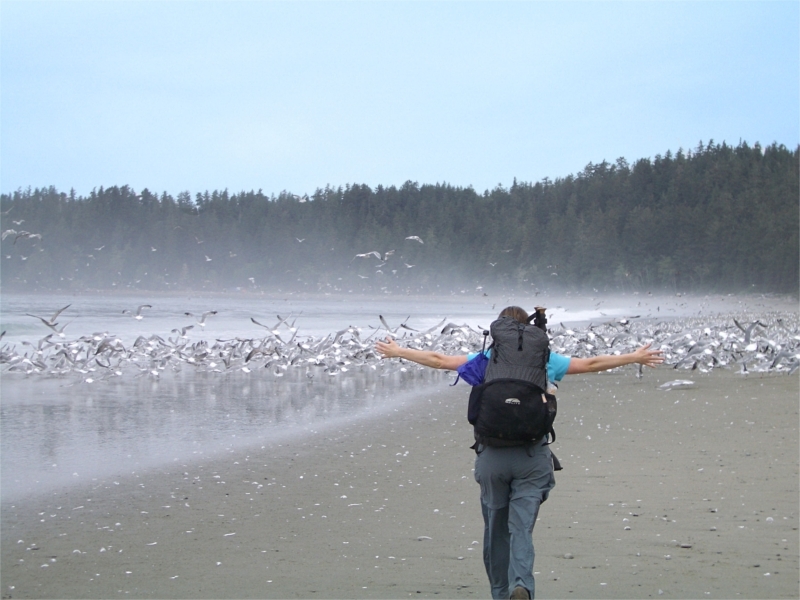 She set off a chain reaction – as one group of birds started to take off quickly – so did the next and the next and so forth. Before we knew it the air was filled with thousands and thousands of birds swirling around quickly, looking for a new place to land. The seagulls were incredibly coordinated, despite how dense the air was with them and how fast they weaved past each, no mid-air collisions occurred. It was a profound experience being so close to nature and surrounded by so many wild birds. We probably did get pooped on a few times – but hey – that’s a small price to pay for such a fond memory. The other thing that was motivating Tim & Bills rapid pace through this section was the thought of Monique’s. Its reputation definitely precedes it. It’s talked about with almost mythical proportions by people who have been there before. 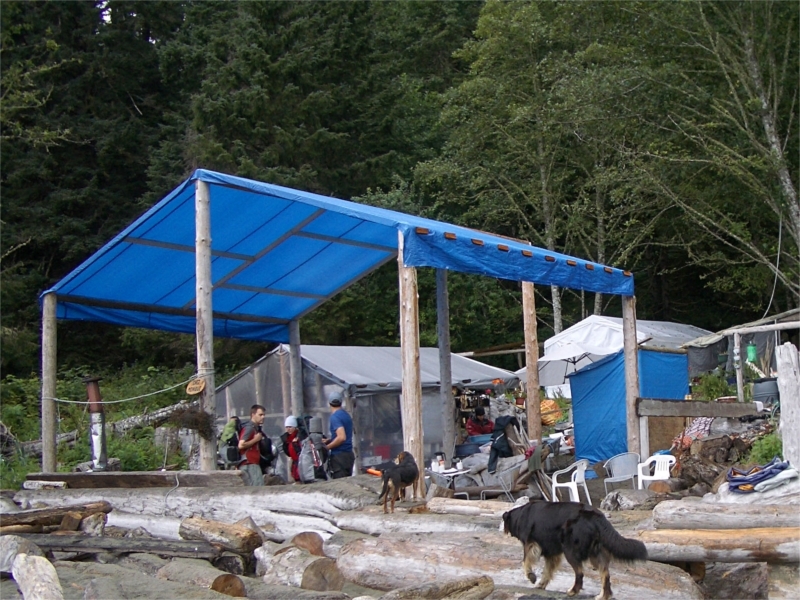 Out here, in the middle of nowhere (so it seems), miles from either trail head, and seemingly miles from the nearest road, is a small set of cabins and some large tarp-structures on the beach. It was only 10:15 am – a little early for a burger, so we went with the breakfast option. Tim & Bill ordered Kokanee of course – it’s never too early for beer. We were quite taken aback! It turns out that Monique used to be a programmer for IBM back in the day. 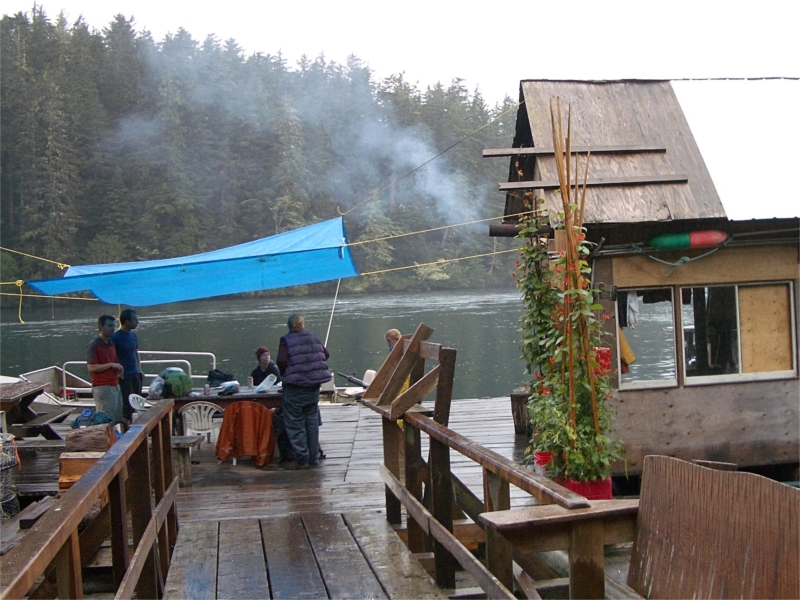 We geeked out about gear and technology for a while, and she told us that she plans to get line-of-sight wirelesses internet access from Neah Bay. She had a young helper working with her who was also fascinated by computers – he was into the idea of laptops with upgradeable components – and the state of solar technology. Monique also told us some interesting stories of when she used to work in accounting at Cadbury’s and had to walk the picket line. They own a boat and her husband uses it to make trips into town to fetch food for the restaurant. Last years windstorm destroyed her old location and now she moved several hundred feet down the beach. A large root-ball of a fallen tree was in the path of where they planned to rebuild and rather than try to remove it – the kitchen now features it. Each tangled twist of the roots has practical element to holding some sort of kitchen utensil. It was quite the creation! The stretch between Cribs and beyond Nitinat had little to offer for water options. Our plan was to wilderness camp for the night somewhere after Nitinat. It was unlikely we would make it all the way to Tsuquanah Pt before dark. We discussed the idea of filling up at Cribs and pack all the water we needed from there. However, Monique offered us another option. She has a hose with fresh drinking water that comes from a spring/creek in the forest. Apparently she has to consume it – otherwise it overflows into the ocean and so said we could take all the water we wanted. We filled every platypus we had – a total of 18 liters of water between us. I think our packs were now the heaviest they had ever been on the trip. The water was fabulous – clear and pristine and required no chemical treatment. 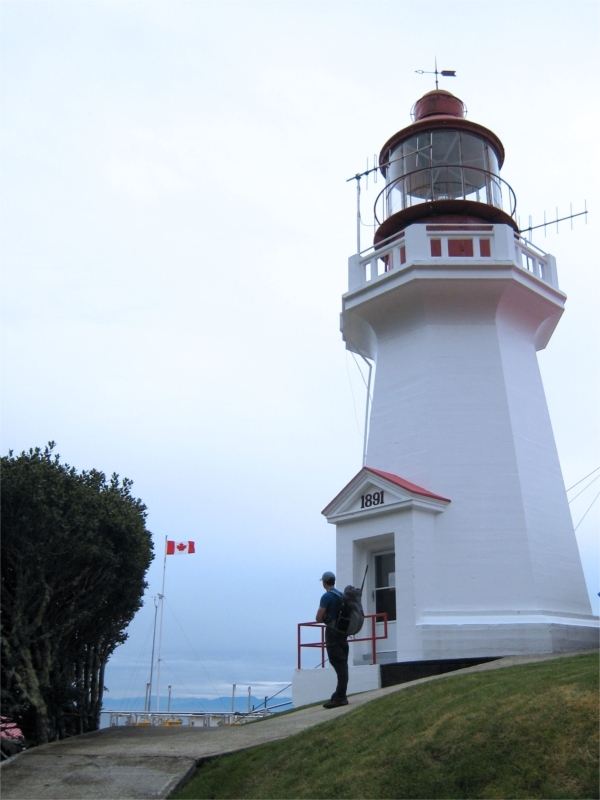 She also told us that there is a standpipe at the lighthouse, that folks may take a ration of one liter per person. Despite the desire to stay at Monique’s for ever – we eventually decided to move on. We still knew that the rains were coming and woud be glad to add any extra mileage we could. I mentioned this to Monique and she was quick to remind me that “rain” is a four letter word. 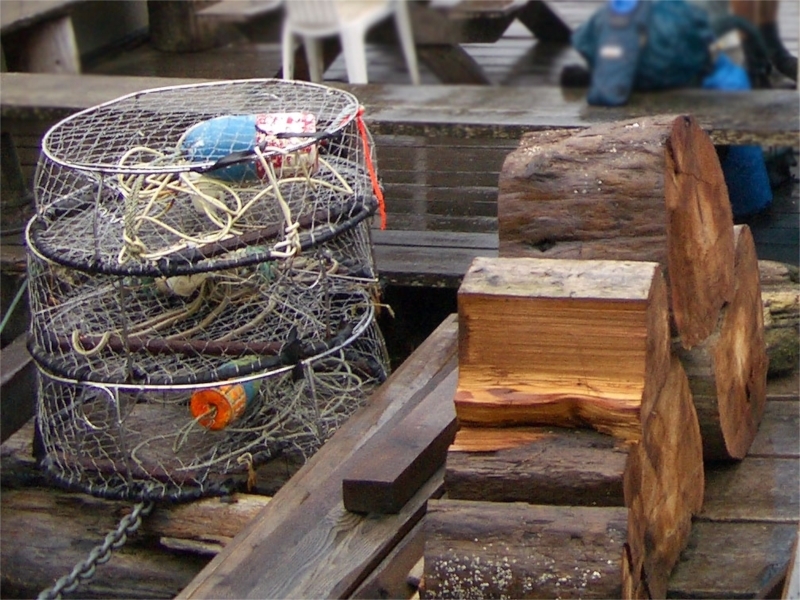 A few hundred yards down the beach, over a little log pile we quickly found the ladder heading up to the lighthouse. In minutes we were up on the bluff and quickly arrived at a gate leading to the grounds. The grounds were pristine and beautiful. It was odd to see such stark contrast of the wilderness of the trail and the well manicured lawns of the lighthouse keepers. The keepers were out of their home on the grounds as they had two groups of visitors. A lady and her daughter that had come down from Nitinat to visit and also a group of Park Rangers that were in the helipad building. One of the rangers approached us. She looked concerned – “Wow – you guys all have small packs. Do you have a tent in there? Do you have a stove?”. We assured her that we were well prepared and even had 18 liters (or 38 lbs!) of water between us if she fancied a sip. I nodded over at a long death-slide cable running all the way from the light house to the rocks below and asked “Is this the way down?”. She didn’t seem to see the humour – and recommended that we “best stick to the stairs”. 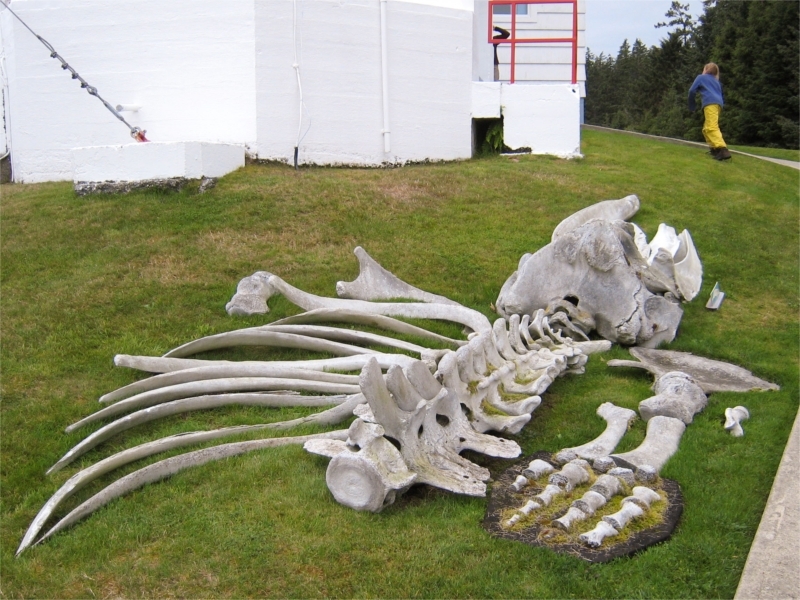 Near the base of the lighthouse, sprawled out on the lawn was an enormous set of bones from a large Grey Whale. The lighthouse grounds were well equipped. There was a beautiful vegetable garden, complete with green house. A large helipad to the north and a large set of diesel tanks to the south. I assume it takes an serious amount of fuel to power the lights during the course of the winter, and that’s not something you want to run out of. We moved on, and descended the stairs onto the beach on the other side of Carmanah Pt. As we started walking north of the beach, we noticed (and heard) a large raft of sea lions. They stunk. No they really stunk. The smell was overpowering as we walked on. 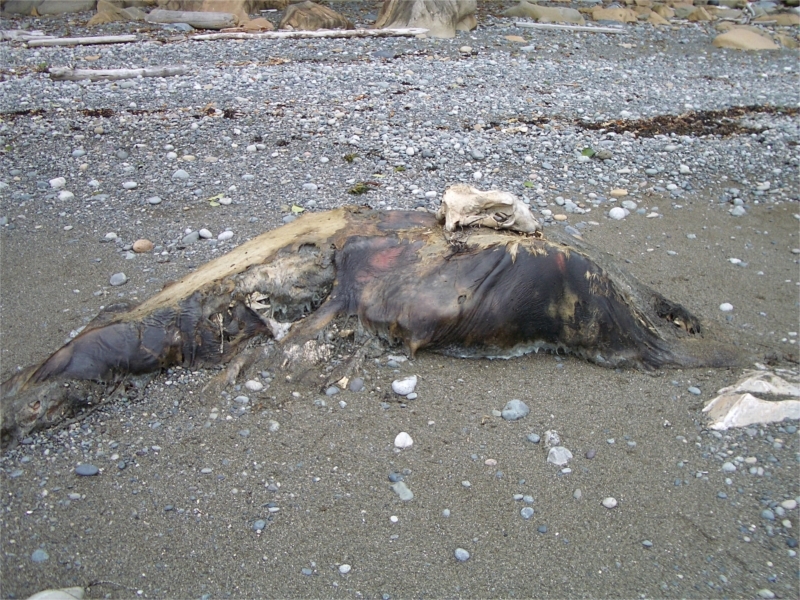 Bill: “erm… guys… I think it’s a sea lion skull.”. Sometimes you just can’t see the forest for all of the trees. Bill suggested that Tim try and ride it Rodeo style, but he declined. Most unsporting of him. We continued to hike on the beach on our way towards Cribs. This section of beach hiking was spectacular. 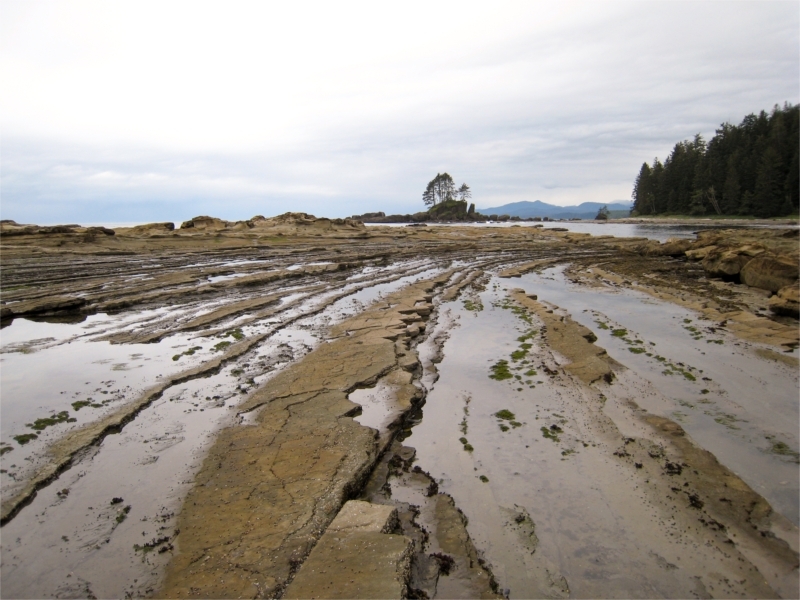 The sandstone shelf of the ocean was exposed in all of its glory and there were multitudes of tide pools. Walking on the sandstone was very slippery and poles helped stop any kind of fall. afforded us some enhanced traction. 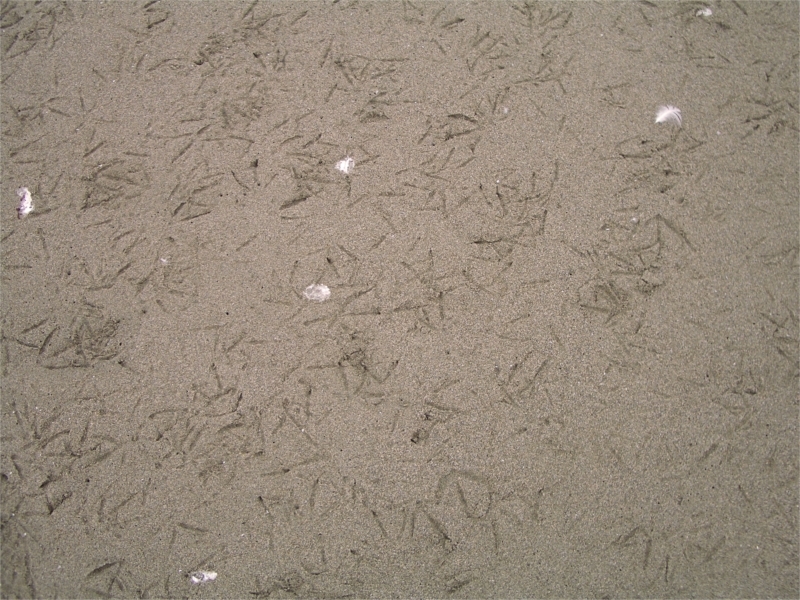 The shelf was also covered in muscles from time to time, although we were warned not to eat them as red tide was prevalent at this time of year. 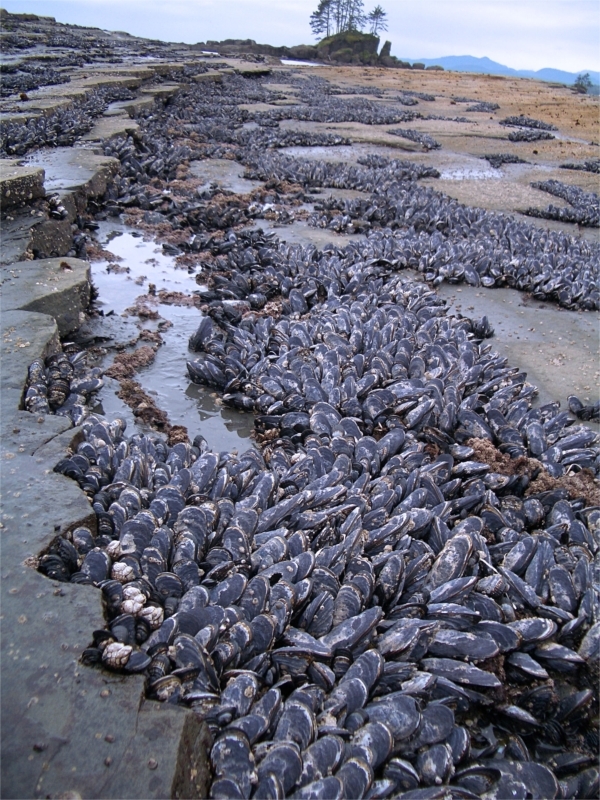 Eating such contaminated muscles can lead to paralytic shellfish poisoning. Within ten to thirty minutes, what starts as severe abdominal pain, can prove fatal if not treated quickly. The ability for a rapid evacuation in that situation is unlikely. Despite the temptation, we chose to avoid the fatalities. 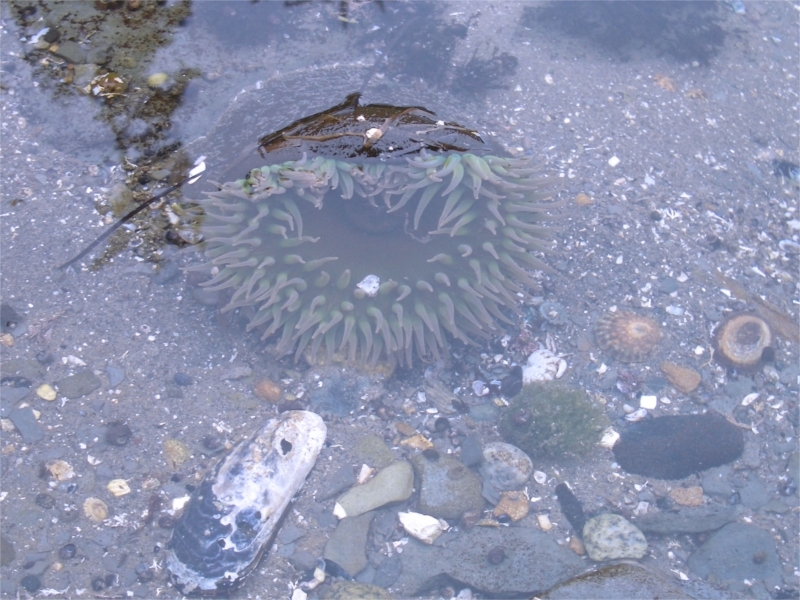 Amidst the various tide pools we also came across countless urchins and sea anemones. 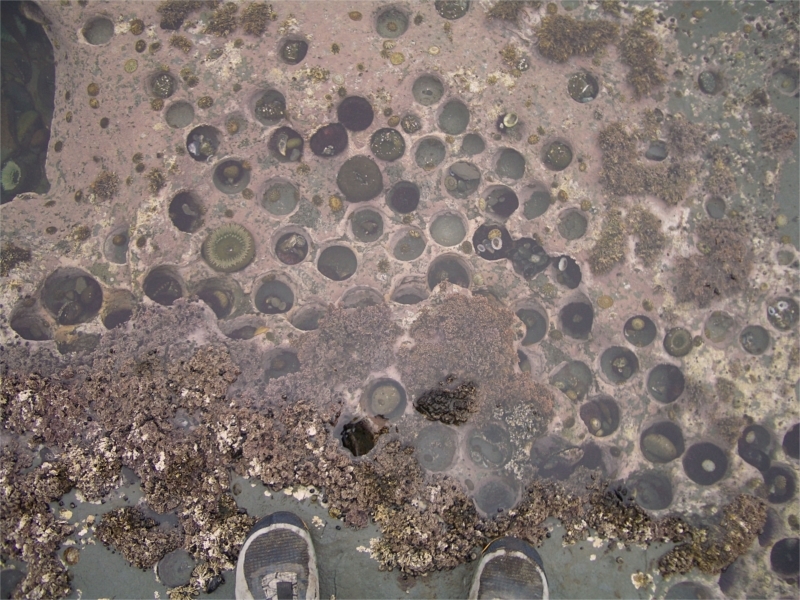 I haven’t really spent time on a beach like this before exploring such tide pools and so was fascinated with it all. To Theresa – who grew up on the Olympic Peninsula – it was about as routine as me growing up going to the pub in England. Yet – she was amused by my amusement. We searched long and hard for a starfish – but alas did not find one. Bill found a dead one, but that didn’t really count. We pulled rocks and found crabs and all sorts. The colors were vibrant and the formations intriguing. We lingered a little too long here, and Bill & Tim were getting anxious about the time. We needed to make it to Nitinat by 5pm and it was close to 1pm now. It was time to start moving. Soon enough, we arrived at Cribs Creek. Once again the tide was against us – and we would not be able to make the crossing of Dare Beach – so we headed back onto the forest trail. High up on the bluff, wresting with mud and roots still, the weather started turning fast. What started as a light drizzle felt like it was about to open up. We put away our poles and broke out our umbrellas. Bill was still skeptical at this point. A few hundred yards later and the heavens opened and down came the rain. 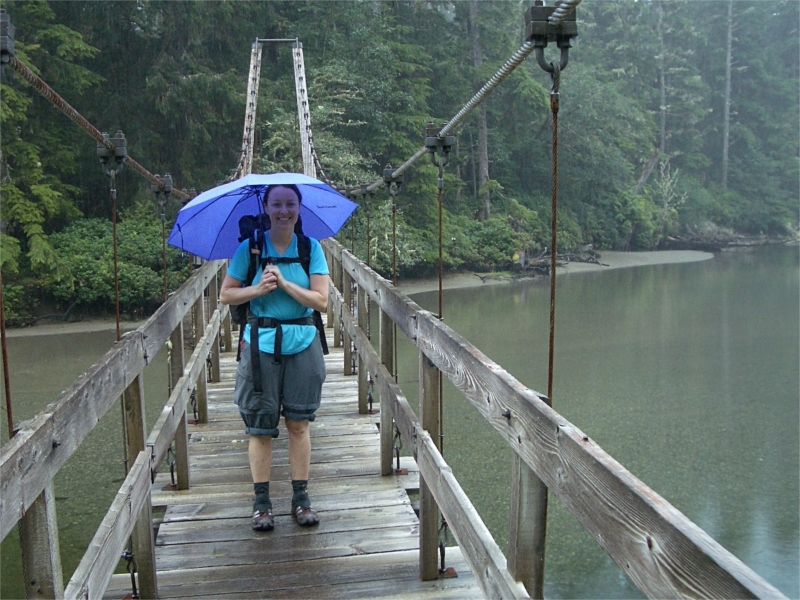 Not a gentle trickle – but heavy West Coast Trail rain-forest style rain. 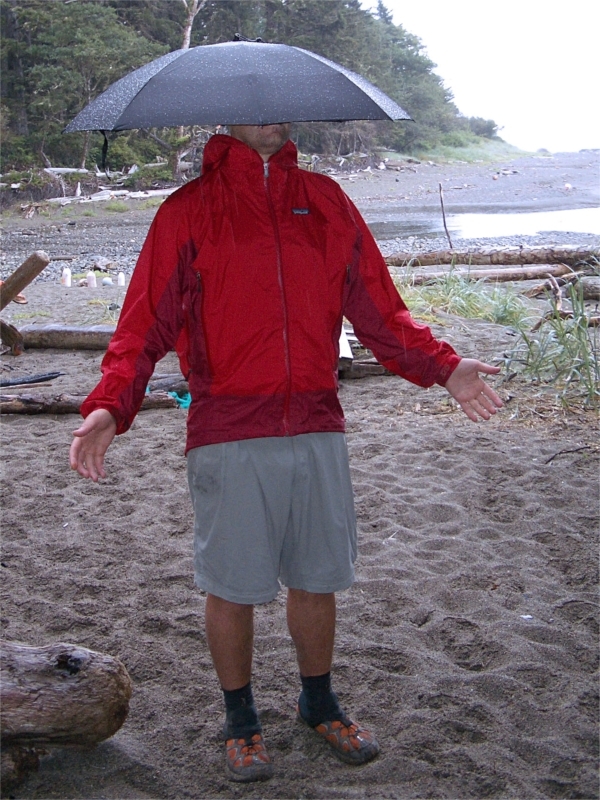 Later that day, Bill turned into a “believer” and Tim perfected the “hands free” mode of using the umbrella. The trick was to stuff the handle into the chest harness of your pack. It proved to be quite a “handy” technique – no pun intended. The trail between Dare Pt. and Nitinat was brutal. It was unpleasant going on the way to Cheewat. The usual mile after mile of mud and tree roots. 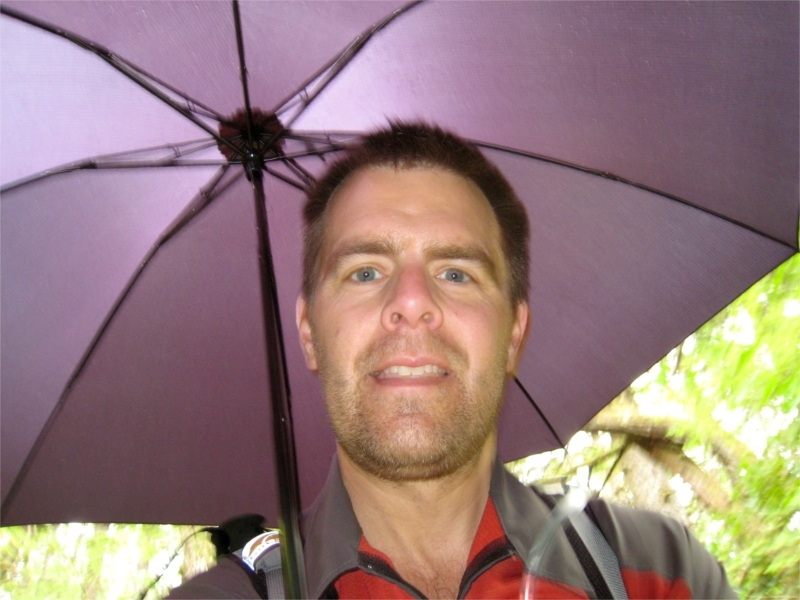 The umbrellas performed incredibly well in this terrain – despite getting snagged on low branches and trees. I was sure that one of us would tear a big hole in our umbrellas at some point. The Montbell umbrellas are so light that they also appear quite fragile. One bad fall on top of that thing and it could snap the stems easily, but fortunately it never did happen. Around 3:15pm we crossed over Cheewat river. It was still coming down hard. Just over the bridge of the Cheewat to the right is a very small spring. This is the only source of water in the area, as the Cheewat itself is too salty to be potable. We ploughed on as we still had several miles to cover before the last ferry crossing of the day – and the trail was slow going. The section between KM 34 and Nitinat was insane. For us – it was by far the worst section of the West Coast Trail – far worse than anything that south section had thrown at us. I suspect it may have been exasperated by the heavy rains – as it’s not mentioned in most other peoples experiences. We are talking giant, monstrous mud-pits. Boardwalks that runs at 45 degrees to horizontal with swamps off to the side. The worlds biggest Styrofoam buoy as the only source of stability in a sea of mud. It is hard to put into words – and we certainly didn’t pause to take any photos on this section. With just ten minutes to spare – at 4:50pm, we arrived at Nitinat Narrows. A blue tarp was overhead which offered immediate shelter from the rain. We were tired after a long arduous hike. The woman and daughter we saw back at the lighthouse were here. How did they possibly get here before us? The took a boat from the lighthouse to the narrows. If only we had known! There were two ferrymen at Nitinat when we arrived. The first one took the woman and girl and sailed them north to the village. Meanwhile Dwain beckoned us into the hut. He threw some logs onto the potbelly stove and cranked up the heat. We huddled around trying to dry out our damp muddy clothes. Dwain had fresh crab and freshly caught salmon available for dinner. 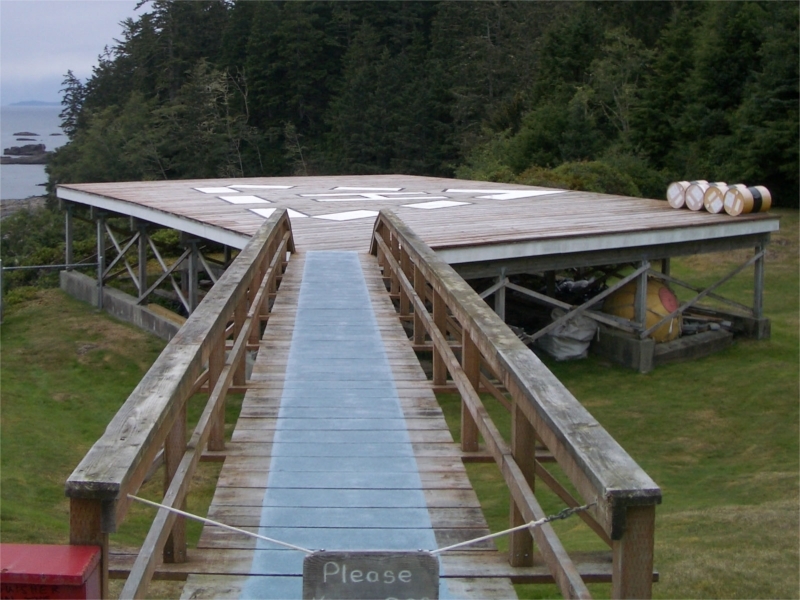 One solo hiker that had come in on the ferry heading south decided to eat – but we declined. I was sorry that we did – as the salmon looked fabulous and came with baked potato! Still, we had freeze dried beef stew to look forward too! We sat by the stove and dried out for the next hour and a half, while Dwain told us some fantastic stories of his tribe and traditions. 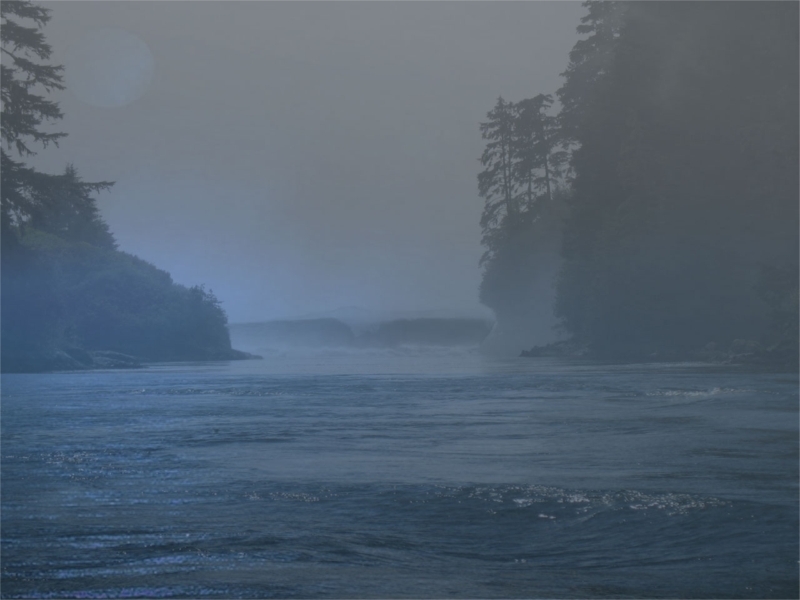 The mood was eerie… the Nitnat was flowing upstream – away from the Ocean – and flowing fast. While we sat, a low mist came in over the river. We could see a sea lion swimming upstream fishing for salmon and some large kingfishers on the other side of the bank. He told us that to make things more fun – he wanted to perform a funny routine when they came ashore – so they made up postures and body-language to describe their story and when he mentioned the key words, the boat crew had to form into these poses. “I told everyone the plan before we got into the boats – they all thought I was mad – but I wanted to do it anyway. We came ashore and did the routine and it went over really well – everyone was laughing and howling and came up to us at the gathering making the poses – it was a great way to get to meet lots of new people”. Dwain said he knew over 300 songs – many of which were in languages that were not the familiar to him. He pulled out his mobile phone and had recorded many of them using the voice-recording feature. He played some back to us and we heard the chanting and singing first hand. I was humbled at the intensity of the experience – I felt like I had gone back in time and was part of some book – like the Hobbit where Bilbo and the Dwarves are shown the hospitality of Beorn. Here we were out in the deep wilderness, dusk creeping upon us, the rain driving down, a mist flowing upstream getting a tiny glimpse into the culture of the inhabitants who have lived this land for thousands of years. He pulled out an enormous “skippers” paddle that he had been given given at one of the gatherings, and told us about Paddle Lummi urging us to look at the site when we got home. It was getting late – around 6:30 pm and we still had a few miles to cover before dark. We asked if we could huddle up around the fire for the night – but it wasn’t an option. We needed to get going again and face the rain. Dwain called the dog to jump in the boat and we gathered our gear. The crossing was very short – barely a five minute journey – but a dramatic one at that. As we moved downstream and crossed over to the other side of the bank, we could see all the way down the Nitinat and into the ocean. Huge waves – ten foot high were crashing between the channel between rocks and breaking into the narrows. We crossed the narrows – and started up the trail leading to the bluff. The climbing came on fast and the rain came down even harder. We were ready for a break from the mud and roots by now, but the trail did not offer it. Yet more – crazy slippery mud filled paths leading along the cliff side. 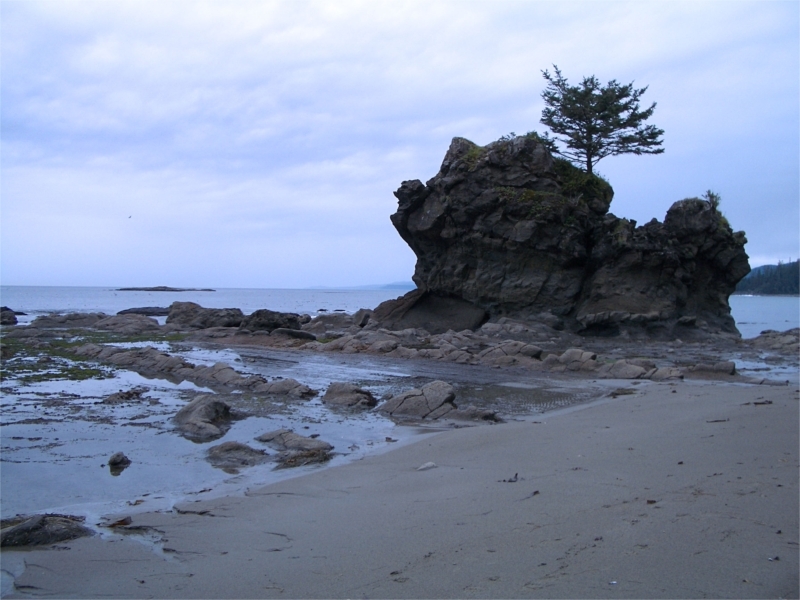 Our goal destination was the first beach access near KM 31 – Dwaine had told us that we’d be fine camping on the beach near there. The trail was different here – misty views over the ocean and hard pounding waves far down below. I turtled again, going down a slippery section of trail. Boom, into a thick mud-pit. Fortunately my pack took the damage – and was caked in a thick layer of clingy mud. Eventually we can across what looked like a path going towards the cliff – and could see buoys in the trees. I went down to investigate and soon found myself having to essentially rock-climb my way down to the beach – it didn’t feel right. We bailed on the idea and kept moving. After another fifteen minutes or so, we came across another trail down to the beach. This time where was a ladder – so we were confident we were in the right location. We dropped down the cliff and explored the beach area. We found signs of previous campsites and a fire pit. We pitched our tents on the beach in the rain. The sand was very loose here and we had a hard time getting the pegs of the tarp tent to stay in. Unlike a traditional dome tent, they are required to be under tension to keep the tent up. We made deadman anchors out of drift wood and piled rocks on top to help create the tension. It worked OK.
As soon as our tents were up, the rain stopped. A welcome break that allowed us to make dinner and hang our food. 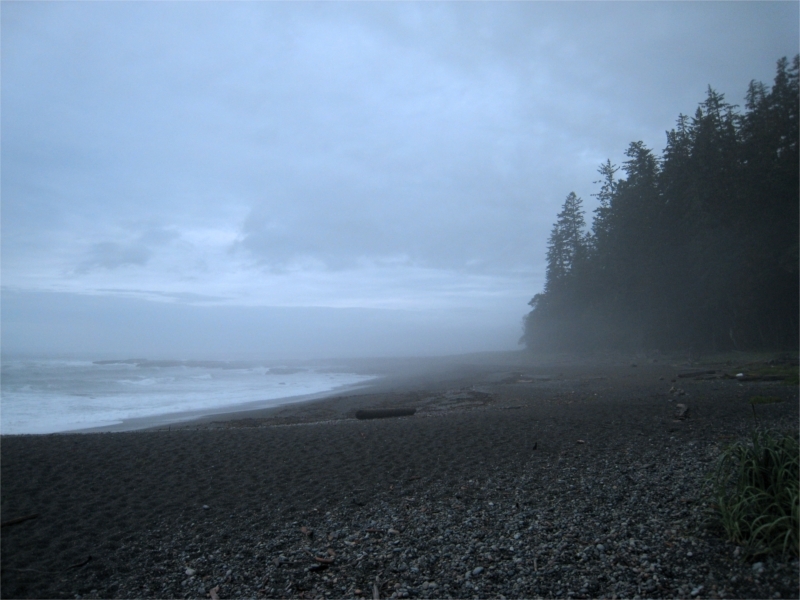 The mood on the beach was intense and the campsite very exposed. It was two hours after high-tide, yet there were enormous waves pounding down hard on the beach. The waves were ten or twelve feet high most of the time, and they broke right on shore – making a deafening sound. The surf from the crash rolled far up the beach and stopped not far from our tent. There was no other good place to pitch the tent – and it seemed like the sand had not been disturbed by the sea, so we thought we would probably be ok.
We double checked the tide-tables -high tide was at 6am – but Tim was very concerned. He thought that the storm that was bringing the rain in might be pushing the waves farther up than normal. If the sea did come in on us over night, there wasn’t anywhere to run to – the cliffs were steep behind us. We made a game plan, and set our alarms for 4am to get up and check the position of the tide. It made for a nervous night and we all went to bed a little on the spooked side. > Bill suggested that Tim try and ride it Rodeo style, but he declined. Most unsporting of him. Now THAT would have made for a great photo!